Getting media into your project on Aframe is easy using either our built-in upload tools, as outlined below, or using our Desktop App. Simply log in to your account, and select your chosen project. Click on the green &apos;Upload Media&apos; button on the right-hand side of the page. 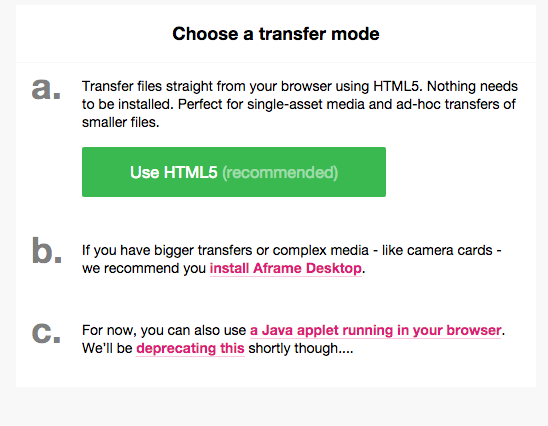 This will launch a little upload window as shown below, where you will have different transfer modes available. 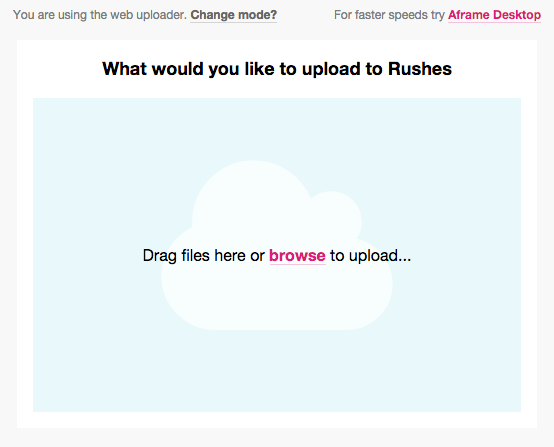 Option a: Our HTML5 uploader - This method requires no plugins/installs and is great for single assets, ie you cannot use it to upload folder structures e.g. camera cards. This is down to a limitation of the technology presently available on the market. You can also use this method from your mobile device in exactly the same way as outlined below. If you need to upload folder structures, move to option b. Once you have selected the HTML5 option you will be greeted with the below window, where you have the option to just add the media to the project, add it to an existing collection or create a new collection. Each file will be sent to the project as it hits 100% completion, no waiting around for everything to complete. If your browser crashes, simply reload and the upload window will bring up the list of files that it still needs to complete, just drag across the files it advises (as shown below). This method of upload also means that you are able to upload media from your mobile device! Option c: At this time (option to be phased out, find out more here), you can still utilise our web based Java applet, which is capable of uploading single asset and complex card structures. Depending on your operating system and browser, you&apos;ll need to allow Java access to your machine at some point in the upload process - Mac users click here and Windows users click here. You will also receive a pop up window requesting you give access, which you can opt for your computer to remember your response for all future requests from us. You will then be greeted with a similar window to the below, where you can opt to upload straight into the project or you can choose to create a new collection for the media to be added to on arrival. Once you have created collections, you will also have an option to add to an existing collection. The next window shows the upload console, with your desktop on the left panel and the transfer queue on the right panel. You need to select your files or folders on the left, then choose the &apos;>&apos; icon from the middle of the console, which will move the selected files/folders into the transfer queue on the right. The << and >> icons will move everything from either the left or right panel. 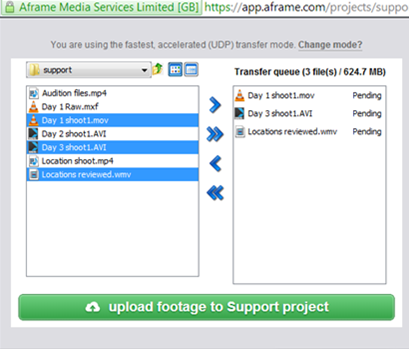 Once you&apos;ve finished building your transfer queue, click on the green &apos;upload footage&apos; button. 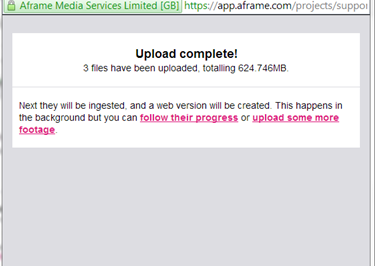 The app will get to work uploading your selected media into your project on Aframe. Once the transfer is complete, the pop-out window will load a little message to tell you that it&apos;s done. 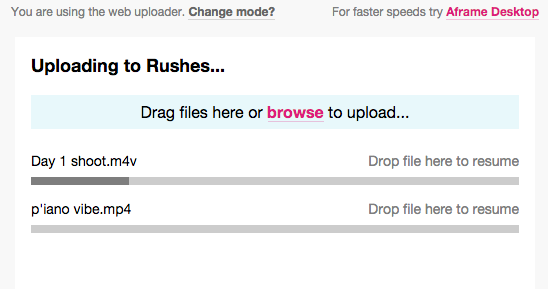 It&apos;ll also give you links to either track the progress of ingest and upload, or to upload more files. 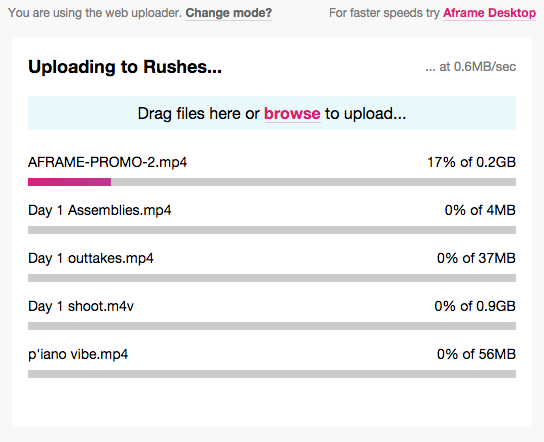 If you selected multiple files to upload, your footage will not arrive on the Aframe servers until every file has finished uploading (as indicated by the below screen shot). If you should be the unfortunate victim of a connectivity dropout, there&apos;s no time wasted - the transfer will resume from where it left off. Accidentally missed off a file before kicking off the transfer? No problem - you can add files to the queue whilst the transfer is under way. Just click back into the pop-out browser and add in the usual way. Check out this page for the required information your IT guy may need on ports and addresses used during data transfers.